Coal exploration in Chickaloon is just beginning. Riversdale Alaska has made many promises to the people of Chickaloon. Unfortunately, so far they haven’t lived up to their own assuring words. The last couple weeks of helicopter invasion in Chickaloon wasn’t anything close to what they told us to expect. So who exactly is Riversdale Alaska? Can we trust they will be good neighbors to the people that live here if we allow them to mine coal? This article in the International Resource Journal gives a picture of their intentions and exuberant attitude toward getting their hands on Chickaloon coal. Notice how they gloss over the fact that hundreds of people live here and it is a culturally historic site for the Chickaloon Tribe? 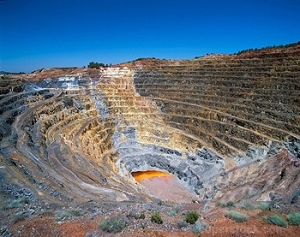 A Rio Tinto mine in Spain. But the real worry is what they will do once the mine is in full swing. Riversdale Alaska appear to be “mine flippers”. They open mines and then sell them to major international coal companies with terrible reputations. They sold the Mozambique project to Rio Tinto, one of the largest mining companies in the world with the worst record for human and environmental violations. Riversdale Alaska seems very proud of its association with Rio Tinto and downplays the accusations against the mining giant. Is this what we can expect for the mining project here in Chickaloon? People of Chickaloon: Stay informed, stand your ground, and protect our way of life!